We are honored to be celebrating over 60 years of serving your pets. Pet Emergency? Call us right away at 336-838-3441! If you live in Wilkesboro or the surrounding area and need a trusted veterinarian to care for your pets – look no further. Our Veterinarian's are experienced in treating all types of pets. Your pets’ health and well being are very important to us, and we take every possible measure to give your animals the care they deserve. The Animal Hospital of Wilkes is a full service animal hospital and welcomes pet patients in need of routine medical, surgical, and dental care.Our doctor's have years of experience treating serious conditions and offering regular pet wellness care. Beyond first rate pet care, we make our hospital comfortable, kid-friendly, and calm, so your pet can relax in the waiting room and look forward to meeting our staff & veterinarians. 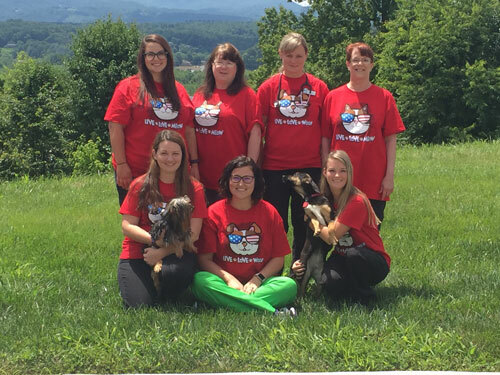 At the Animal Hospital of Wilkes, we treat your pets like the valued family members they are. Sign up below or "Like" our Facebook page. You can stay up to date on our news and specials! Whether your pet needs basic wellness/preventive visits or if they have a serious illness/injury that needs care, our Doctor's are experienced and able to help your pet. Monday-Friday 8:00 a.m. - 1:00 p.m., 2:00 p.m. - 5:00 p.m.